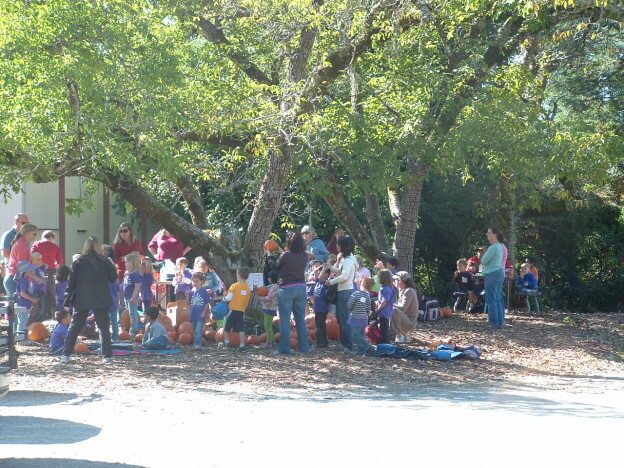 THE TOUR: The children meet near the farm shed under the walnut trees and the students hear a 10 minute talk about “How to Grow Organic Apples”. They will be shown 10 different kinds of apples and asked to name each and identify how they are used. During the walk through the orchard to pick their 10 apples of their choosing they will be asked to see if they can find the 10 kinds of apples. At the other end of the apple orchard they will see where the chickens live that lay the colored eggs and see the baby chicks. They will also see some of the farm equipment such as the tractors, trucks, forklifts, etc. On the return walk many children accompanied by teachers and parents find the secret trail that leads them through the enchanted forest of big redwood tree giants. After returning from the apple orchard to pick their 10 apples for $5 they usually have lunch or a snack in the shade on the tables under the walnut trees. If time permits they can visit the Apple Cider Building to see how Apple Cider is made and receive a fresh free sample. Upon leaving the ranch some may wish to visit the farm shed where they can purchase organic fruit and vegetables at discounted prices and see some of the old farm equipment and tools used in the 1800′s. I am the parent field trip coordinator for my daughter’s class at Discovery Charter school in San Jose. We would like to schedule an Apple picking and Apple Cider making field trip for our class. Please let me know how we can go about making this possible. We were there last year at your farm and we really enjoyed your farm and all the apples we picked. Thank You! I believe that we completed everything on the phone so you are now scheduled for your Apple Visit September 30th. If there is anything more please let us know.